Hi! My name is Iván Batalla, I’m a young 3D Artist from northern Spain. I’m a beginner who discovered Blender around a year ago, and since then I have been modeling almost every day, learning new things with each project and, of course, by following YouTube tutorials. Let’s take a look at my latest model, the Gateway Galaxy from Nintendo’s game “Super Mario Galaxy”. The idea came to my mind with one of the latest topics of the WeeklyCGChallenge, which was “Tiny Worlds”. At first I wasn’t going to participate, but suddenly, a few days before the deadline, Mario Galaxy came to my mind, and immediately the whole project took form. After looking for some references (mostly from YouTube playthroughs and the game itself), I opened Blender and started it! To keep my inspiration and the overall mood of the game, I played the OST on the background while working. That’s something I always do, as I work better with music. One of the reference images for the egg planet. I knew from the start that I wanted to use Sketchfab for this, so one of my priorities was keeping it as low poly as possible to allow smooth moving on the viewer. The whole modeling was made using Blender. Each planet was created on a different file to keep it clean and tidy. The most useful tool while modeling the planets was the LoopTools addon. For example, the holes of the hollow planet were made deleting random faces and using that addon to smooth the edges. The green ovals of the Egg Planet and the stones from the Initial world were made in the same way, smoothing the original geometry with LoopTools to make circular shapes directly on the surface. I also beveled some of the edges between grass and stone and scaled them a little bit to the inside to add some depth. The main planet had more details on it than the others, so it was the longest one. The bridge was made with just one unit repeated with an array modifier and rounded with a curve modifier and a bezier curve. I used metaballs and a remesh modifier to make the tree, and they were new tools that I had never used before. At first I planned to make just the planets, but at the end I decided to create all the assets and include them on the model to bring life to the scene. It was a great addition, and maybe the most enjoyable modeling. This was the easiest part. I created multiple materials for each planet, and added them to the proper faces. I did a temporary UV unwrap, added one texture per material, and then fixed the UV lands to match texture’s size with the object’s scale without worrying about overlapping them and other issues. After that, I made a new and proper UV unwrap for each object, and baked Diffuse and AO maps for every planet with Blender Internal. All the assets were baked into a single texture using the TextureAtlas addon, avoiding to join all of them together. Most of the textures were downloaded from textures.com and overlaid with procedural textures using GIMP to recreate a bit better the game’s look. The flowers and box’s textures had their own way of creation. I created 3D models for them on Blender and rendered the viewport in GLSL texture mode (it’s faster than Cycles or the Internal, and also allows me to change lightning, specularity…) with an Orthographic Camera at the top. Last, I modified the textures using the node editor. Making textures on the viewport. I chose this workflow because it’s easier for me to make actual 3D models than painting those textures on GIMP or other software. As I said, I knew from the very beginning that this was going to be a step. After arranging all the planets together with their respective coins, enemies, characters… I exported the whole model into .fbx format and uploaded it to Sketchfab. First was the light setup. I used the Milky Way environment (unexpected, uh?) cause it fits perfectly with the model. I added 2 directional lamps with the same direction, one for the shadows, and the other one to make them softer. They also add interest to the scene. All materials were almost the same, using the PBR workflow. They use the Diffuse map for each planet with low amounts of metalness and medium amounts of Roughness and Specular FO. This last one helped a lot to get the game’s look. 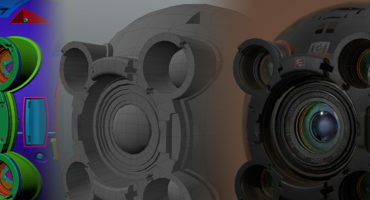 AO maps were used to control Ambient Occlusion and Cavity, while the .png Diffuses were used for Bump, Transparency and Emission on some materials. For me, the most awesome feature in Sketchfab’s viewer is its amazing Post-Processing Filters section. I often see nice models that would look really stunning with some of these filters, but for some reason they are forgotten, and the model looks just flat. They can change completely the model’s appearance. On this particular model, I used all the filters. Usually, this slows down the viewer, but that was another reason for making it low-poly; it has a smooth navigation even with all of them. The SSAO helped to darken some spots, and also to create ambient occlusion for the assets. The DOF filter was used very subtly, just to blurry the blue lines between the planets. The Bloom effect works very well with emitting objects, making the little star beings, the colored balls, the lines… glow and fit better with the overall scene. By using the Filmic Tone Mapping and the Color Balance, I added a bluish tint to the scene, and darkened the background. I also adjusted saturation, contrast… The rest of the filters, such as Grain or Vignette, complete the scene with small extra additions. Last, but not least, the Annotations panel allowed me to make the viewer at the other side of the screen interact a bit with the environment and the characters, as if they were actually playing the game. Bring the models to life using annotations! It brings life to the scene! And after almost 3 days of work, it was finished and uploaded! A few days later, I won the 2nd place of the “Tiny Worlds” challenge with this model. And that’s how it was made. As I said at the beginning, I’m still learning, so some workflows are probably off from the usual workflow, but it might be helpful for someone! I hope you like it, this was a fun and satisfying experience, both making the model and this Art Spotlight. 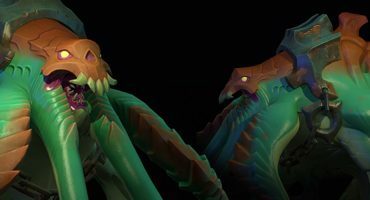 If you are curious about my other models or early renders, check out my ArtStation and Sketchfab ! Feel free to ask about whatever you want on the comments. See you! Sooo much to discover in this asset! No surprise you were one of the winners in this challenge! 🙂 Thanks for the insight, I really loved reading it! The idea was to make it fun to explore… so yes, there are quite a few things to discover 😛 Thanks for the comment, I’m glad you like it! Awesome Job and great read as well, thanks! Thank you very much! 😀 I hope people start using filters more often.